Applications: When used with our polishing compounds these spindle mounted felt tips or points give a bright mirror polished finish. They are ideal for small componeents and detailed work. Spindle size is 3mm, so can be used with airtools and dremmel type tools with 3mm collets. Product Notes: Made with a medium-hard 60 density giving flexibility and longevity. Please select your required shape from the images and choose the size accoring to your specific needs. 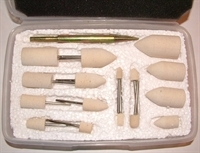 Also worth considering is our set of 16 felt bobs and mandrel, part number WS.PVS.SET.17.A. Also Available: Polishing Compounds for use with our felt products. Spindle Code T means supplied without spindle for mounting on tapered shaft.